Of all American naval officer portraits, those of midshipmen are perhaps the rarest. In the early 19th century, these young officers made only $19 per month, and most of that quickly flowed into the hands of the mess caterer, the laundress, and the haberdasher (one had to keep up appearances, after all). Unless they hailed from a prosperous family, there would have been little money to pay a miniature painter for a likeness to send home to friends and family. The Museum recently acquired a lovely portrait of a midshipman who seems to have scraped together the funds to hire a proficient artist. We don’t know his name, or the name of the artist who painted him, but he represents for us the hundreds of “young gentlemen” who sailed on Constitution in the early nineteenth century. An unknown US Navy midshipman, 1830-1841. His pose, while frequently associated with Napoleon Bonaparte, was in fact a genteel affectation adopted by many gentlemen in their portraits. USS Constitution Museum collection. 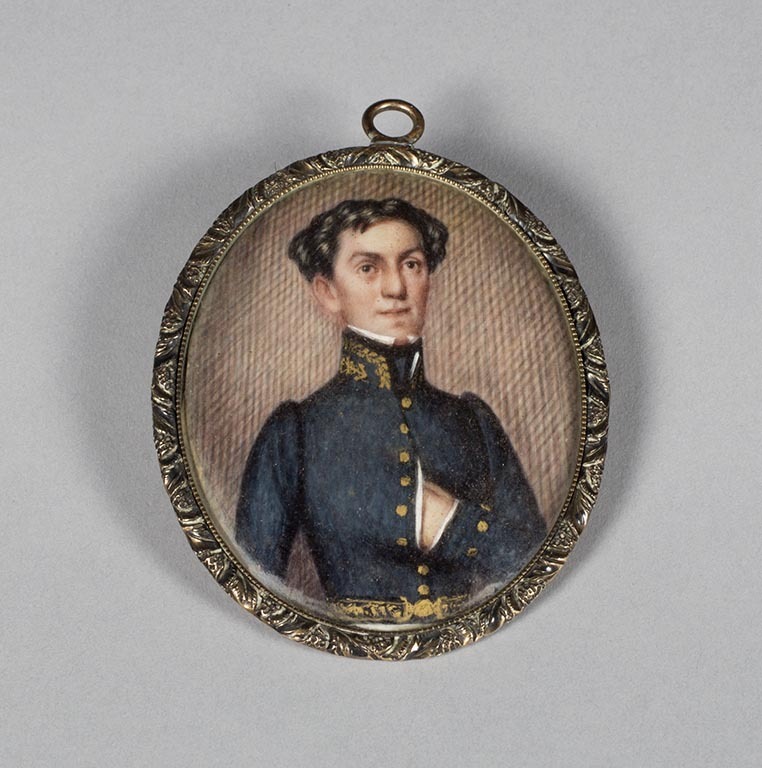 This particular fellow was painted between 1830 and 1841, because he wears the full dress uniform a midshipman as prescribed by Navy regulations during those years. His single-breasted blue coat, with nine buttons, follows the fashion of the period. A thick layer of wadding in the breast gives his coat the pigeon-breasted look so sought after by fashionable young men in the 1830s. The breadth of the shoulders are exaggerated by the gathers in the sleeve cap. Wide shoulders and a padded chest give the appearance of a narrow waist. The decorative embroidery on the collar reveals his rank. Along the top of the collar, the tailor embroidered a “live oak leaf, with acorns,” and below that a “foul anchor.” This anchor twined round with a cable is still the insignia of a midshipman, worn now on the front of the cap as well as the coat collar. While his coat follows uniform regulations to the letter, his sword belt varies widely from what he should have been wearing. The regulations called for white webbing belts with full dress, and blue webbing for undress. Yet our midshipman wears a beautifully embroidered belt, probably made of leather. The style of it suggests it was an older belt, perhaps retained from the 1820s, when belts like this had been worn extensively by military officers. The reverse of the image. The hair appears to have been affixed with red sealing wax. USS Constitution Museum collection. 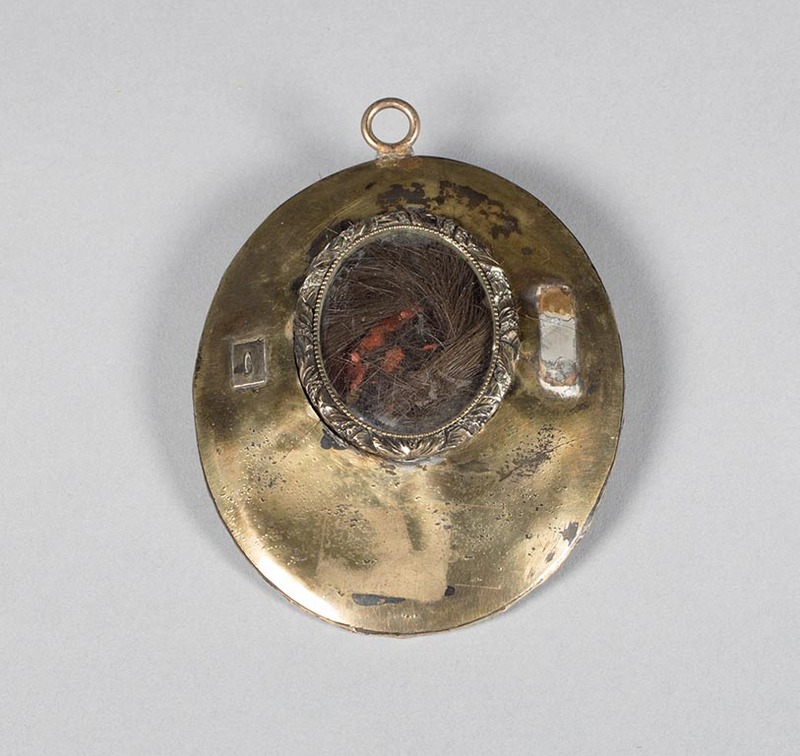 The case in which this image resides features a chased border and a beaded bezel typical of the 1830s. The reverse holds one further surprise. Encased within another beaded bezel is a plaited lock of hair. It is a lustrous brown, and presumably came from the sitter’s head. For whoever received this personal symbol of devotion it must have helped sooth the loneliness when the sailor was away at sea.